Garlic Ranch Chicken Wings - Let the Baking Begin! Simple Garlic Ranch Chicken Wings, a great baked chicken wings recipe giving you juicy, crispy chicken wings in a garlic ranch flavor. Simple oven baked wings recipe! These garlic ranch wings are the perfect recipe during sports seasons. If you’ve got a sports fan in the house, you will love this recipe! My husband loves his wings crispy. 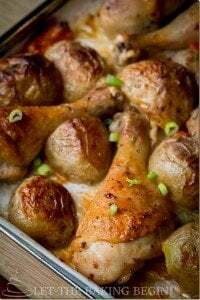 This baked chicken wings recipe will give you a delicious juicy chicken with a crispy bite. Getting the crispy effect on your baked chicken wings! Baking the chicken on parchment is a must if you want them crispy, as it makes it much easier to flip them when you want to crisp up both sides. So get yourself a 5-pound bag of chicken wings at the store and get cooking! My family enjoys these Baked Chicken Wings with mashed potatoes and a side of salad. Combine chicken wings paprika, dry ranch seasoning, salt, garlic powder, minced garlic, and mayonnaise in a large Ziploc bag and mix to coat. For maximum flavor marinate for couple hours. Line baking sheet with parchment paper and place wings all across. If not enough room, use another baking sheet. Bake for 45 minutes at 400F or until tops of wings are golden and skin is crispy. Flip to crisp the bottom of the wings. Serve hot with your favorite sauce right away. What are your favorite chicken wings recipe? There are many different flavors for baked chicken wings; barbecue, spicy, garlic, and so much more. What is your favorite way to prepare and/or eat your wings? Other great chicken recipes to enjoy! Grilled Chicken Kabobs Recipe – Nothing better than chicken kabobs!! 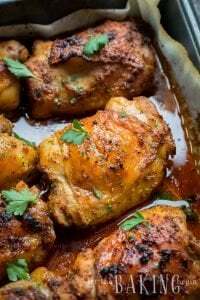 Paprika Baked Chicken Thighs – Delicious chicken thighs in a special paprika spice blend. Easy Chicken Garlic Wings – Anther great wings recipe! Use a ziplock bag or a large bowl to combine 5 lbs chicken wings, 2 tsp smoked paprika, 2 Tbsp dry ranch seasoning, 1 Tbsp kosher salt, 2 tsp garlic powder or 3-4 pressed garlic cloves and 3 Tbsp of mayonnaise and mix together to coat. For best results, it's best to leave the chicken wings to marinate for a couple hours or even overnight, but I've done it right away as well with wonderful results. Line a rimmed baking sheet with parchment paper then spread the wings all across. You might need to use 2 baking sheets, as to not overcrowd the baking pan (like I did below). Allowing the hot air to circulate all around will make the chicken wings more crispy all around. Bake for 45 minutes in a preheated to, 400F oven or until the tops are golden and the skin is crispy. Rotate the pan halfway through. Now, flip each wing upside down and bake on the other side for another 10 minutes to crisp up the bottom. This is when you'll really appreciate that you had parchment paper - it prevents the wings from sticking and makes it much easier to flip them upside down. OMG, these wings are amazing, I used 2 parchment lined trays, never even flipped them, they were perfect after 45 mins! I can’t wait to share with my 2 sisters and 4 daughters! They will go bonkers for these! Their fellas will flip their lids!!! that’s so awesome! Thanks for your feedback! The smoked paprika takes this recipe over the top. I mistakenly made it with regular paprika and it wasn’t nearly as good. The kids love it and that’s half the battle. Yes, the smoked paprika is the magic! I’m happy your kids liked this recipe! The first time I made these, they were so salty I could barely eat them. The second time, I eliminated the extra tablespoon of salt and they were much better. The ranch seasoning is already so salty, you don’t need any extra. Great troubleshooting! My ranch seasoning does not have any salt, so the extra salt was needed, but if yours does than definitely drop the salt. I made these wings many times and cooking them again today! Thank you for this recipe! Thank you for your feedback Tanya! What kind of dipping sauce is that? This is a GREAT recipe! 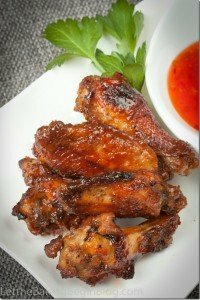 I follow the recipe exactly and the wings are flavorful and crispy. For my dipping sauce, I make the standard wing hot sauce recipe, but add 3 ounces of cream cheese and melt it in. Oh my. Yum and more yum. These are so yummy and my husband loves them. His request is to have these every game day! Thanks for sharing your feedback Tanya! These look amazing!! 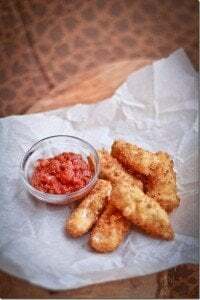 Have you tried this with drumsticks? How long would I cook them if I wanted to try? Yes this would work with drumsticks as well. I would cook them at 375F for about an hour to an hour and 15 minutes. Just start checking the chicken for softness at around 55 minutes, since some drumsticks are bigger while others are very small. 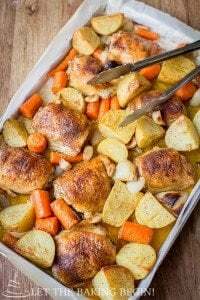 I tried this recipe and my husband and I love it. I was never a really big fan of wings because there was not many sauces I cared to eat. But now I’m really excited about making wings. Now I ask him if he wants wings instead of him asking me. Very yummy and easy to make. That’s awesome! thanks for your review! Great recipe! I can’t believe how easy it was to get great wings. The whole family loved them! I’m glad you enjoyed the recipe Sharon! I found mixing the mayo with the ingredients to be a pain. I slathered with mayo then sprinkled spices over. Cant wait untill there done marinating. I am so making these. I don’t think my husband and I alone could eat 5lbs though lol going to have to cut this in half or something! Can’t wait to try!!! Since wings are a lot of bone, it’s not as much as you think 🙂 Good luck! So true!! We ended up making almost 3 lbs and they were DELICIOUS. Best wings I’ve ever had. Thanks so much for the recipe!!! Do you recommend the wings not be frozen when I toss them? Yes it is best if they are thawed. Otherwise it will take more time to bake, which I haven’t done and couldn’t recommend how long to increase the cooking time for. 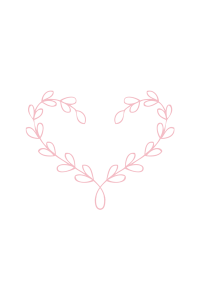 Due to unfortunate circumstances…(I was too lazy), I marinated them for 24+ hours. I baked them on a pyramid baking mat so they would star crispy and it worked perfectly. This is saved and will be used over and over again! Longer marinating time is never an unfortunate circumstance, but instead a benefit (within reason, of course), so I’m glad you liked them! Pyramid baking mat sounds like a great idea! Thanks so much for your feedback! Love it when people come back to tell me about their success with the recipes I post! Oh, I bet they were amazing from the smoker!